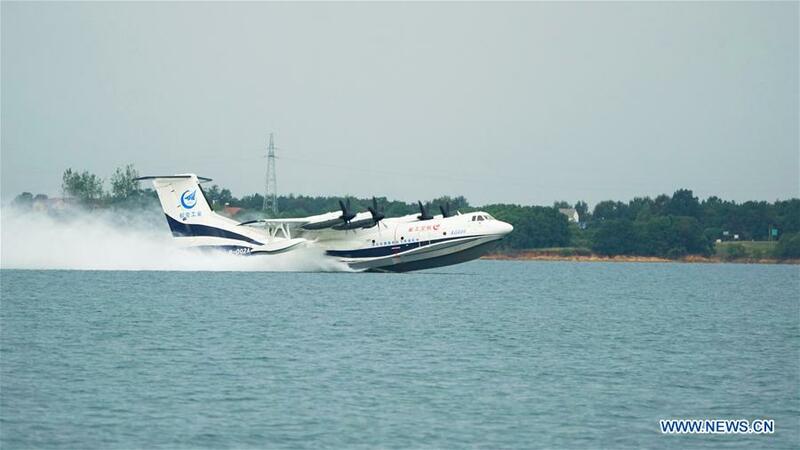 China's independently-developed large amphibious aircraft, the AG600, on Monday completed its first taxiing at high speed on the water, according to China Aviation Industry General Aircraft Co. Ltd (CAIGA). The test at a speed of 145 kilometers per hour was carried out in the city of Jingmen of central China's Hubei Province. CAIGA, headquartered in the southern province of Guangdong, said that the AG600, codenamed Kunlong, was in stable condition and functioned normally during the test. Designed to be the world's largest amphibious aircraft, the AG600 is powered by four domestically built turboprop engines and has a range of 12 hours. It will be mainly used for maritime rescue, fighting forest fires and marine monitoring.